Shoreline Farmers Market will be at Shoreline Place every Saturday from 10am-3pm, through October 6th. Shoreline Place, 155th and Westminster, upper level by Central Market. July makes us happy because of the bountiful berries, the warm evenings, picnics in the park, but most of all because of sweet delicious corn! 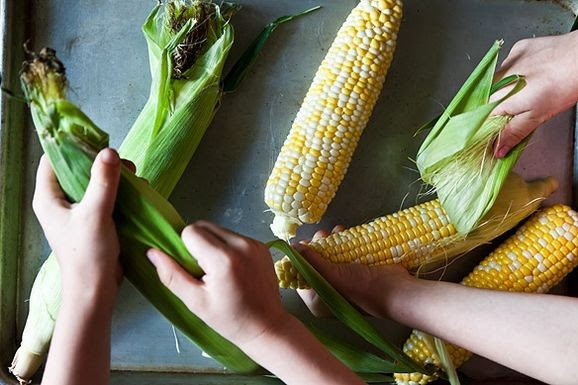 Here are some tips on how to find the best corn at the market without peeling back the husk. According to Food 52 Blog: feel the kernels though the husk. You are looking for plump and plentiful kernels. Locate the tassels (those silly looking things at the top) and find ones that are brown and sticky. Now check out the color of the husk. Look for a bright green colored husk that is tightly wrapped. In some cases the husk will be damp because of its freshness. 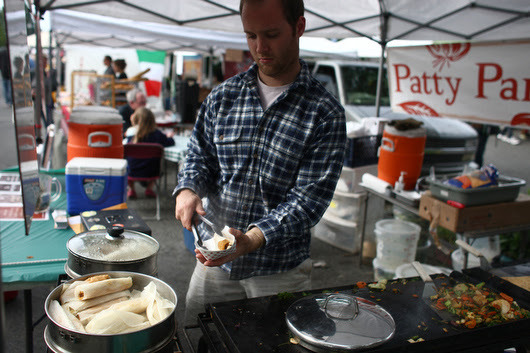 Patty Pan is bringing their popup grill to the Shoreline Farmers Market this week. Serving tamales, quesadillas, and market grilled veggies all day long. Looking for more Patty Pan food? Did you know - Patty Pan hosts community dinners in Shoreline the first Monday of every month for just $10. And DON'T strip the husks to look at the kernels - wait until you are ready to pop the ear in the boiling water before stripping the husks - the sugars start turning to starch as soon as it's ripped open - ear will be sweeter and kernels tender!